Woody weeds such as brambles (Rubus fruticosus) can be difficult to eradicate once they have become established. Prompt action can prevent problems and using the right methods lightens the work of dealing with thickets of robust weeds. What are brambles and woody weeds? Brambles are a frequent problem, especially in neglected areas of the garden, or under hedges. Ivy is another common woody weed that grows not only over the ground and through plants, but also buildings and fences. Other woody weeds that can cause problems in gardens include suckers and seedlings from trees and shrubs. Brambles have long, thorny, arching shoots, which can grow 1.8-2.5m (6-8ft) in length, and root easily where the tips touch the soil. Brambles can become a problem where seedlings are allowed to take root, or where stems of established plants have rooted at intervals. Woody weeds such as brambles, ivy and tree seedlings and suckers can be difficult to eradicate once they have become established. Hand pulling and digging young seedlings as soon as they are seen will save a lot of hard work later. 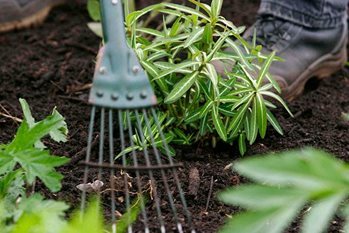 A thick mulch of chipped bark or compost will also make it much easier to pull out recently germinated seeds in the spring. In light, workable soils, cut back the scrambling stems to around 30cm (1ft) from ground level. Strimmers will deal effectively with large areas of woody weeds. Dig out the bramble stump, taking the roots away at the same time. It is important to remove as much of the below-ground parts as possible, as brambles have the ability to regenerate from well below soil level. Seedlings should be weeded out by hand. Stems and roots shaken free of soil can be finely shredded and used as a mulch. Alternatively they can be taken to a local council green waste facility or burnt in bonfires. However, bonfires create pollution and may also annoy neighbours. They should be conducted when wind and weather mean that smoke will not enter houses or inhibit others from enjoying their garden. Here are some government guidelines on bonfires in smoke control areas. Cut back all long, trailing stems to within 20-30cm (8in-1ft) of soil level, and deal with as above. Immediately afterwards, apply a suitable weedkiller such as triclopyr (SBK Brushwood Killer) or glyphosate (tough formulations such as Roundup Ultra, Roundup Tree Stump & Rootkiller, SBM Job done Tough Weedkiller (soluble sachet only) or Doff Maxi Strength Glyphosate Weedkiller) to the freshly-cut ends of the stems, thoroughly wetting them to ground level, following the manufacturer's instructions. SBK Brushwood Killer contains a selective or growth-regulating weedkiller (triclopyr) which breaks down in the soil within about six weeks. It controls most broad-leaved weeds and young woody saplings. It does not kill grass, though some damage to lawns and fine turf may occur. It is effective applied to the foliage of woody plants such as brambles from spring until autumn.